The outside temperature reached 111ºF this week with the humidity. I'm beginning to think they are on to something with this global warming situation. The worst part about it was standing outside talking to my neighbor for TWO minutes and I started sweating like the back of a cold toilet. We could not get the temperature to dip under 83º in the house even with 4 ceiling fans, central air pumping out at maximum capacity, and all the curtains closed. I felt like a sewer rat in my own home. And now I have a cold because of it. What could make this any more irritating? I wanted cookies. Of course I wanted cookies. When do I not want them? I was not about to turn on the oven. I may be crazy, but I'm not insane. These are the moments you truly have to be thankful for anything no bake, especially the minty sort that cools down the mouth when you take a bite of it, like these. Unfortunately I had to work fast. My truffles started to sweat once I took them out of the fridge to snap a photo. At least I know it's not only me. Using a food processor, pulverize cookies until they resemble crumbs. Pour into a separate bowl and add cream cheese. Mix until combined. Roll into 2" balls and place on a cookie sheet lined with parchment paper or a silicone mat. Place in the fridge for a least an hour. This will help firm the balls up for dipping. Using a double broiler method, melt chocolate in a heatproof dish until smooth and creamy. I found using a skewer was the best way to tackle these. Dip into chocolate and be sure the ball is completely covered. Place on cookie sheet until all balls have been dipped. Place in the fridge to allow chocolate to set and firm up. Melt wafers in microwave using a microwave safe container. Using a fork or a ziploc bag with the corner cut off, drizzle over truffles. 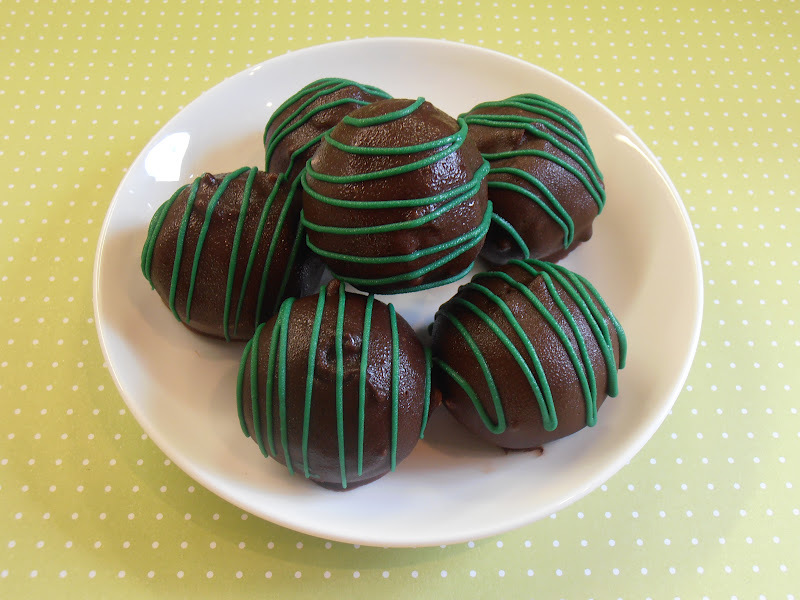 Yields: About 24 Grasshopper Cookie Truffles.